Our nation underwent radical change as a result of the Civil War transforming from a primarily agrarian nation with a small international footprint to an industrialized nation with economic influence abroad. For information on the early stages of industrialization or for information about the railroad, review Cultural Change: Industrialization and Cultural Change: The Railroad and Immigration. The theory of Social Darwinism not only advanced the idea that human beings are in competition with one another for positions in society, but also suggested that the ultimate success or failure of an individual or group had more to do with something intrinsic to that person than with external, social inequalities. Social Darwinism framed progress as linear, and advanced the viewpoint that non-industrial cultures are primitive and, in a hierarchical world, are less valuable than industrialized ones. Social Darwinism continues to influence our perception of poverty, race, gender and their relationship to success. Horatio Alger was the writer of cheap and immensely popular novels directed toward a primarily young male readership in which the characters, in spite of their poverty, were able to pull themselves up by their bootstraps and attain success. These stories underscored the belief that social mobility was dependent upon hard work and good moral fiber. 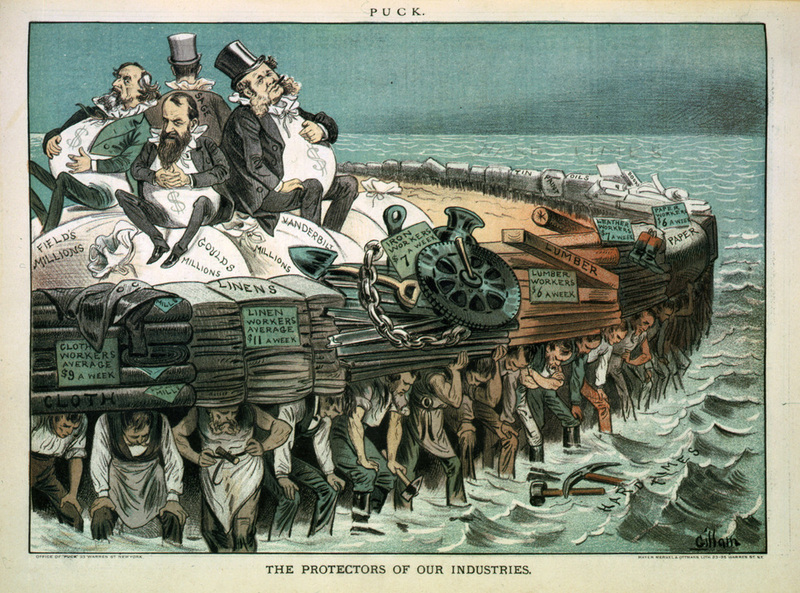 Cartoon showing Cyrus Field, Jay Gould, Cornelius Vanderbilt, and Russell Sage, seated on bags of "millions", on large heavy raft being carried by workers. The Iron Colt Becomes an Iron Horse – Railroads skyrocketed after the Civil War. Track mileage increased from 35,000 miles in 1865 to over 192,000 miles. This cartoon was illustrated by Horace Taylor in 1899, which shows John D. Rockefeller holding the White House and Treasury Department in his palm. It is a commentary on the power of the Standard Oil empire, which controlled 90 percent of the refining business in the late 19th century. Rockefeller reaped huge profits by paying his employees extremely low wages and driving his competitors out of business by selling his oil at a lower price than it cost to produce it. As soon as he controlled the market, he hiked prices far above the original levels. Alarmed by his tactics, Rockefeller, as well as many other industrialists, became known as robber barons. The smoke in the background of the image is coming from the capital of the United States, which is portrayed as becoming an oil refinery, demonstrating the power that many big businesses held over government. This illustration by Frederick Burr Opper, published on the front page of Puck magazine in late 1882, reflected the feelings of many Americans in the time. As businesses expanded into monopolies, the power held by business heads became increasingly more obvious. 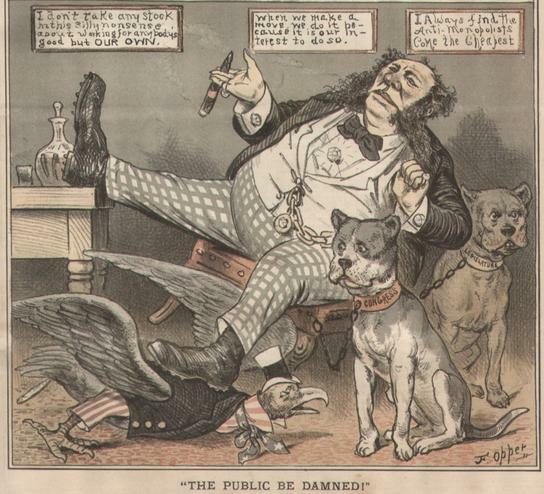 In this illustration, rail tycoon Vanderbilt is pictured, along with a quotation: “the public be damned”. He crushes an eagle meant to represent the people and ideology of America-that through hard, honest work, anyone can become successful- beneath one foot, demonstrating the immense strength corporations hold over society and development. Congress and legislature stand by Vanderbilt’s side, chained and docile, expressing the willingness of government to bent to the whims of big business, despite its destructive nature. 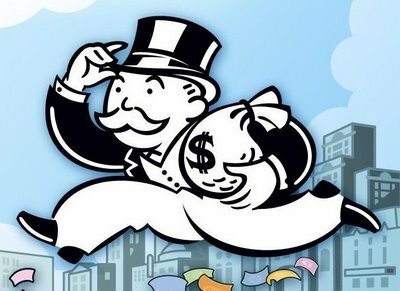 Monopolies were clearly constricting the development of other smaller businesses, and their consumption of weaker industries led to loss in competition and rises in price for the commonplace citizen. As corporations grew greedier and more influential, the government did little to nothing to aid the common workers and small business owners. 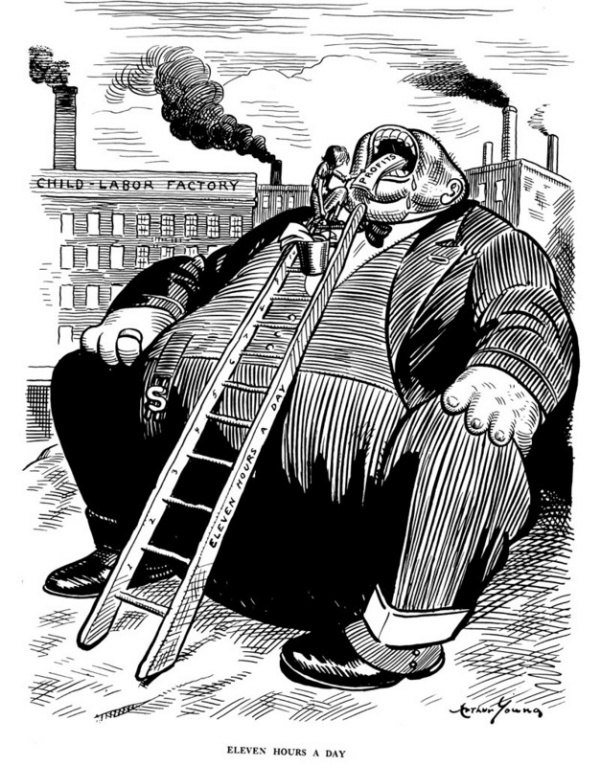 The sentiments displayed in Opper’s cartoon quickly spread throughout the American people, making this a very accurate view into the Gilded Age. Color lithograph by Joseph Keppler. Illus. in: Puck, v. 6, 1879 Dec. 10. 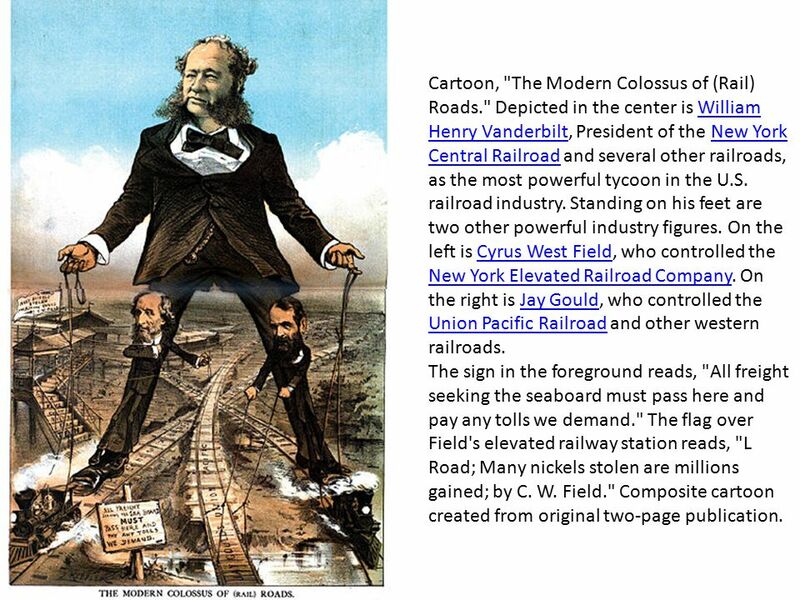 “The Modern Colossus of Railroads”– This political cartoon was illustrated by Joseph Keppler in 1879, which features the railroad “giants”, William Vanderbilt, Jay Gould, and Cyrus W. Fields.Vanderbilt, a wealthy railroad tycoon, was viewed as a tyrannous man of excessive corporate power, which is clearly shown in this cartoon. The reigns held by the railroad magnates attach not only to the trains, but also to the tracks and the railroad station, which conveys their power and control over railroad operations. The three powerful leaders formed a railroad trust out of their Union Pacific, New York Central, and Lake Shore & Dependence lines. However, with the interstate Commerce Act in 1887, the government began to weaken the magnates’ grip over the nation’s transportation system. Andrew Camegie, "Wealth," North American Review, 148, no. 391 (June 1889): 653, 657­62. When Titanic sank in 1912, the world's newspapers were busily discussing the power and corruption surrounding J.P. Morgan & Co. The Morgan empire not only owned Titanic and controlled the Shipping Trust (the International Mercantile Marine Co.), it also controlled a Steel Trust (the U.S. Steel Corporation), a Railroad Trust (the Northern Securities Company), a Life Insurance Trust, a Telephone & Telegraph Trust (American Telephone and Telegraph Co.), and (in the works!) a Money Trust that would soon become the Federal Reserve. 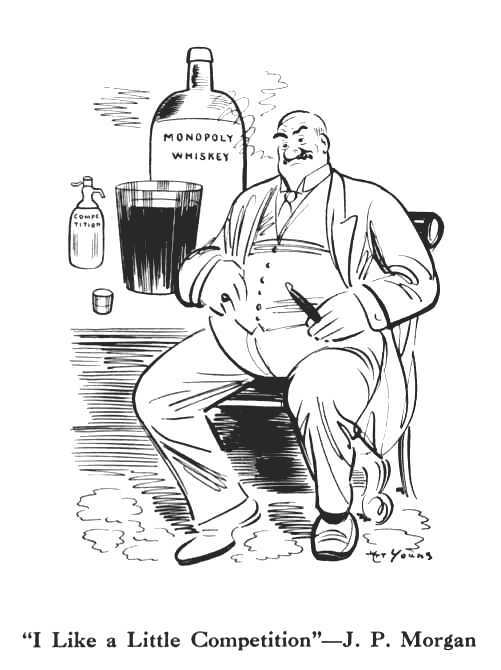 In short, the House of Morgan, aka J.P. Morgan & Co., seemed to be the monopoly that controlled all Wall Street monopolies, and it was even portrayed in the press of that day as a large and omnivorous Octopus, a cold and slimy sea-monster that could reach out one of its many tentacles and latch onto any business in the world, pulling that business into its dark and hungry maw. This tendency to see J.P. Morgan, the owner of RMS Titanic, as a sea-monster convinced many people that he had just had Titanic for lunch. If the great ship had sunk, well, that must mean Morgan himself had found some way to make a profit from the disaster, or feed off the flesh and bones of the people who died.